DO YOU SUPPORT LABOR AND OPPOSE THE TPP? YOU MUST READ THIS! Some Labor supporters have gotten excited by Senator Wong's speech in Parliament on 12 February. (1) Let me warn you that there is nothing for opponents of the TPP to be happy about. I believe the only hope we have now to stop the TPP is for members and supporters of the Labor party to write, send emails and visit backbenchers in the Labor party before a final vote is taken. Why?? Because the leadership of the Labor party is completely behind the TPP. The only chance to stop if is to lobby Labor backbenchers and try to persuade them that the Labor party will be finished as a national party if the TPP is passed by the LNC and Labor. Forget about Labor's vague commitment to social justice or the PBS. Voting for the TPP means giving up democracy in Australia. Any company can override any legislation Parliament enacts, and there is no appeal to the ISDS system which enables this. HOW CAN I KNOW WHAT THE LABOR PARTY THINKS? Like the government, Labor seems to consider opponents of the TPP to be "anti-trade". Senator Wong also claims that the lack of transparency by the Government has given "free rein to uninformed speculation". From what I have seen, opponents of the TPP are not "anti-trade" and are anything but uninformed. Senator Wong's speech hides the fact that the TPP is not about trade, it is about deregulation through the ISDS process. The issue is not about being for or against trade. This is a standard political trick, to deliberately misrepresent your opponent's position. To be "for trade" is like being for good health. It is a motherhood statement. The real issue is this: do we want ISDS deregulation or not? And what does Senator Wong say about the ISDS system? When I read it I almost fell off my chair!! "And in relation to Investor-State Dispute Settlement (ISDS), I again say what I have previously said: this Government should not sign a Trans-Pacific Partnership which would provide foreign corporations with legal rights that are superior to the rights of domestic businesses." Can you see what this means?? Senator Wong, speaking for the Labor party, has no in principle objection to the ISDS process, which effectively ends democracy in Australia. How do I know what the Labor party thinks about the TPP? I just read what they say!! No wonder their "opposition" to the TPP is so insipid. All that talk about intellectual property and the PBS is just sand thrown in our eyes to hide the fact that they support the TPP and they will vote for it. SO WHAT WILL LABOR DO? Senator Wong made the following statement: "Labor’s position—let’s be very clear—is that Parliament should see the final text of trade agreements before they are signed." "A high-quality, comprehensive TPP could deliver access for goods and services in countries with which we do not have existing bilateral trade agreements and it could add billions of dollars a year to the global economy." There you have it! The TPP could "add billions of dollars a year to the global economy." How can one stand in the way of such a fantastic outcome!! Billions of dollars!! Wow! What is the PBS in Australia compared with billions of dollars in the global economy? Just a grain of sand in the great shoe of global economic growth! Still, I wonder if the residents of South Australia realize their Senator Wong is more interested in looking after the health of the "global economy" than she is in the jobs, living standards and well-being of the people who voted for her and pay for her generous wages and benefits? WHO IS LABOR REALY TALKING TO? The Labor party actually had two audiences when it makes statements. People in Australia think they are just talking to them, the people who vote for them. Most people do not realize that there is another far more important audience for their statements: the banks, multinationals and "overseas investors" who are behind the TPP. The Labor party has the difficult job of showing the international 1% that they are "on the same page" with the 1%’s plans for the global economy while at the same time appealing to enough people to get them voted in after the next election. Judging from the response it seems they have been reasonably successful. This is why I have made the suggestion above to lobby the backbenchers of the Labor party before it is too late. Perhaps it is too early to make suggestions about what should be done if the TPP passes with Labor support. If this happens there should be mass resignations from the Labor party, and another party established with the central goal of getting Australia out of the TPP system. Such a party would not be the usual one issue party we have seen before. 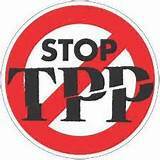 The TPP removes any democratic effort to enact or retain legislation which hiders the profits of any foreign investor. Do you want to reinstate democracy and be able to legislate for reasonable rates of pay and conditions, clean air, clean water, uncontaminated food, safe products, freedom from fracking, continued gun control, subsidized medical care and drugs, etc., etc.? Then join our party. My only warning is that to succeed such a party could not be a "left only" party, or one committed to ending climate change, since the ISSUES RAISED BY THE TPP CROSS ALL TRADITIONAL POLITICAL LOYALTIES AND ISSUES. If it becomes "captured" by one side of one of these traditional issues it will fail. Its appeal must be as broad as possible, and only include people who can actually work with others who do not share what they think are their "core values". There needs to be a new CORE VALUE: DEMOCRATIC SOVEREIGNITY, the sovereign right to make the laws for Australia by a democratic process in Australia. If you think there is some other issue more important than this, you need not join. It is written for members of the Labor party but can be easily modified.